The activities we do are done by keeping the child’s needs in mind. We achieve our goals through the following activities. Assembly:We have assembly twice a week, on Monday and Friday. We find this time of the day very special to gather all our energy to start the day with peace and happiness, and to work collectively putting our efforts at our best. Prayers, chanting, singing and celebrating birthdays in the assembly creates a peaceful and friendly atmosphere. We share short stories, classroom works and discuss common rules and regulation etc., which enables everyone to know what is happening in every class. 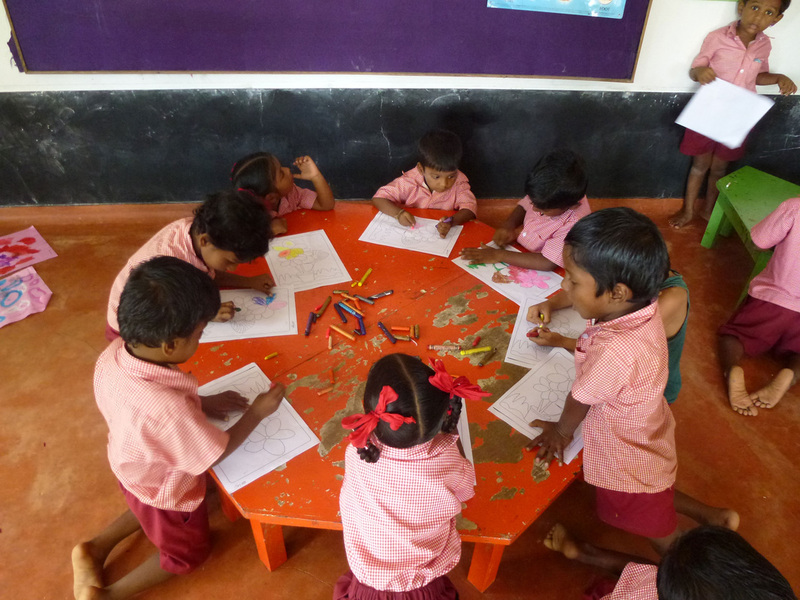 Circle-time Activities: Sharing day-to-day happenings at home as well as at school helps them to improve their conversation (speaking skills) in both Tamil and English. To create a family atmosphere and to develop friendship among the children, we do various activities such as telling stories, singing rhymes, reading flashcards, showing pictures and talking about it, and playing different games. Multiple Choice Activities: To bring out their individual talents, to motivate them to choose their interested work by themselves. to develop hand skills we work on the following activities: using marbles and making pattern works, `Tearing and bit pasting, thermo ball pasting, making models with clay and dough, colouring with crayons and colour pencils, Painting with water colours, poster colour, and natural colours, making cards using finger and vegetable impressions. Playing different wooden games like fixing, sorting and arranging in order, solving puzzles, playing with blocks and in sand-pit. The above mentioned activities were done by mixing the lower and upper KG children and dividing them into four or five groups. 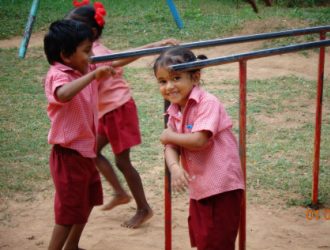 Each child gets familiar with the other children in their group and also develops their helping natures. Similar activities were done in the upper grades at a different level to develop their mental faculties. Field trips: Children are taken on field trips like farms, aquarium, parks, beach, lakes, botanical garden, temples, and railway stations, for exhibitions (clay and photo exhibition). They are also taken for nature walks around the school campus. Celebrations: To cultivate a sense of celebration and to share the joy of each festival with each other we celebrated Ganesh Puja, Independence day, Mother and Sri Aurobindo’s birthday, Nata’s birthday and Christmas. Sensory Development: In order to develop all the five senses we worked on different activities. Activities vary from group to group according to the level and their needs. Hearing: We make children to hear various sounds like soft music, ringing bells, match boxes and filled them with various materials (two boxes with the same). Without seeing the matching box they need to identify the same sounding boxes. Sight:by giving pictures children were asked to look and describe. Two same picture where they find differences and so on. Touch:Identifying the different textures of the various material that they collect in the nature walk. whole group projects each class works on different projects according to their needs. Games room Activities: This is the room which has the library books, building blocks, games and Puzzles. Here children choose their activity and work independently. Here we have various games for motivating and refining their academic skills as well. Sports: Children play various games during this time, like skipping, hopping, lungadi, king ball, kabhadi, kho-kho, dog and the bone, chain cut, ring ball, etc. In the playground they learn to use the sports materials with good care. They also have athletic events like running, long jump, high jump, ball throwing. They also participate in novelty races like spoon and lemon, frog race, card board walk, balloon bursting, musical chair, water filling and tail pulling. Children also learn rhythmic movement for the sports day presentation. Extracurricular Activities: Dance (oddisi), drama, Art and craft, clay work, music are some of the extracurricular activities in which they participate. These are some activities which refresh their minds and help them to learn better. Subjects- languages: (English, Tamil) we give equal importance to both languages. Children learn to master their language skills through storytelling, rhymes, every day conversation, open discussion, describing things, reading and writing. Apart from these the above mentioned activities also involve language learning. 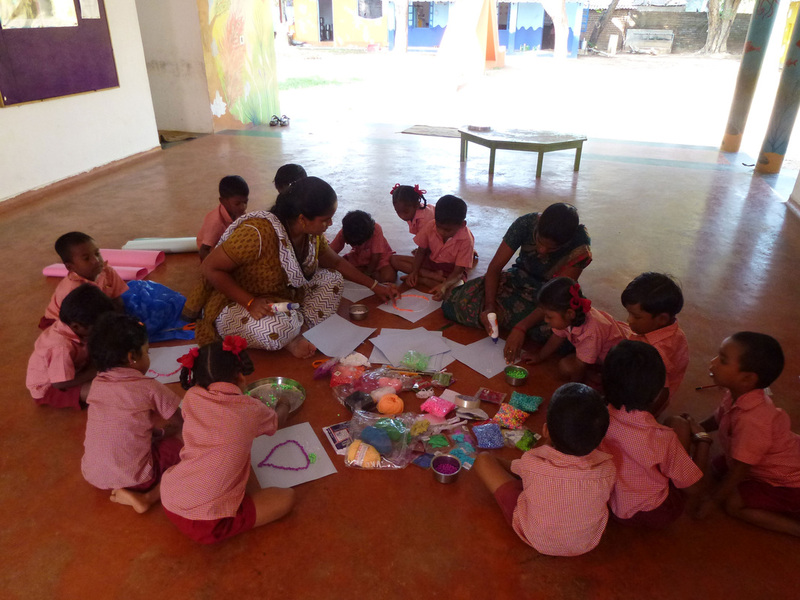 We attend teacher-training workshops regularly to improve our skills.